Starting today, the soup blog will move in a new and decidedly summery direction. Rather than ladling up bowls full of soup for the next hot few weeks (months? ), I will be scooping out bowls of ice cream. Don’t worry. I won’t insult your intelligence with a demonstration of the equivalence of soup and ice cream. I won’t work up some homespun tale about how my siblings and I used make “Chocolate Soup” by stirring Hershey’s syrup into bowls of softened vanilla ice cream. (Um, that one’s true, actually.) I won’t even go the “X-treme” route and claim that ice cream is the ultimate in chilled soups. The truth is, there’s no strained logical justification for this shift. Just that after all these weeks of working my way through the dinner hour from soup to nuts, I’m saying nuts to soup. And switching to homemade ice cream instead. The origins of ice cream in my little world, the primordial soup, if you will began when I was a kid. At the risk of dating my mother (not literally), the story began with a formula she found in a Good Housekeeping cookbook she received at a wedding shower some fifty years ago. The recipe was called “Grandma’s Vanilla Ice Cream” and it has the advantage of being really easy to make and really good. In the coming weeks, I’ll churn out a lot of other “non-vanilla” flavors around this same theme. I’ll also try out some different ice cream bases like a traditional crème Anglaise, the vanilla English custard with the French name. If you don’t/can’t go in for dairy, I’ll also be working up a few sorbets in the coming weeks. And the recipe for that is essentially sugar, water and flavoring. Frozen desserts are all pretty straightforward. They also gives me the chance to introduce my dad to the blog’s story line. In my childhood, my dad was the ice cream expert. He didn’t do any of the cooking as his kitchen expertise was pretty much limited to breakfast. But he was and still is the man in the freezing department. Back in those days, we used a hand-crank ice cream freezer, several pounds of ice and copious amounts of both rock salt and muscles. Nowadays my dad takes it easy on his arms with an electric freezer that churns the custard until it’s too thick for the motor to turn anymore. In other words, until it’s done. Heat milk to 180-190ºF with sugar, flour and salt, stirring until thick, cover for 10 minutes. Beat eggs and add ½ cup of mixture while beating, then add eggs to mixture. Heat the mixture for one minute over medium heat, then cool with plastic wrap or wax paper pressed onto the top of the mixture to keep it from developing a skin. Cool for several hours or overnight. Add vanilla and cream to ice cream mixture. 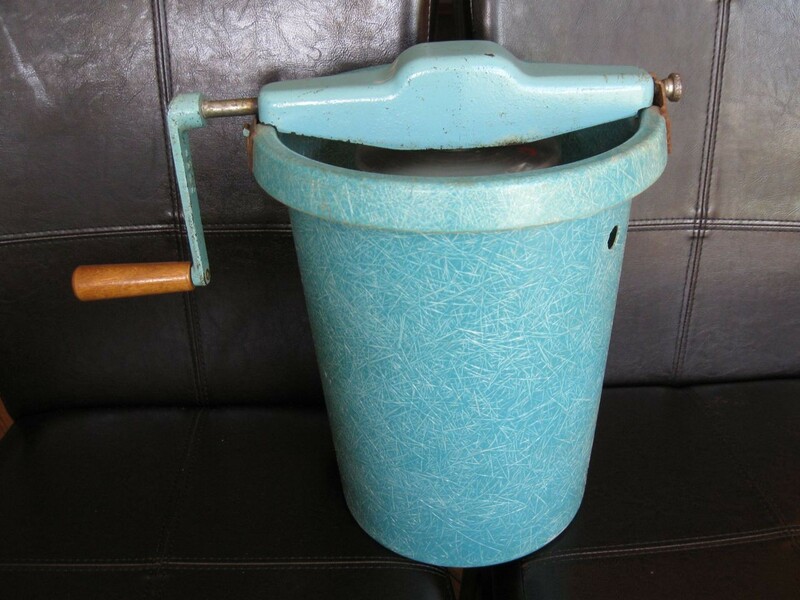 Photo Credit: Our Old Ice Cream Maker, image borrowed from Etsy.com where you can apparently still buy one of these. Check back next week for a fresh new bowl of ice cream. As for the soup? Well, we’ll always have Paris and the archives. Stay cool. And if you’ve got any ice cream/sorbet special requests, let me know. Brilliant segue into the “riot times” upon us! I will add fresh white babcock peaches to my ice cream- yummmm!Keep it up!